As aired on CityNews, Wednesday, Jan. 8, 2014, on City. Catch previous segments of Connected City at CityNews.ca/The5. A close look at the year’s technology trends on showcase at the Consumer Electronics Show in Las Vegas, NV. As aired on Cityline, Monday, Jan. 28, 2013, on City. 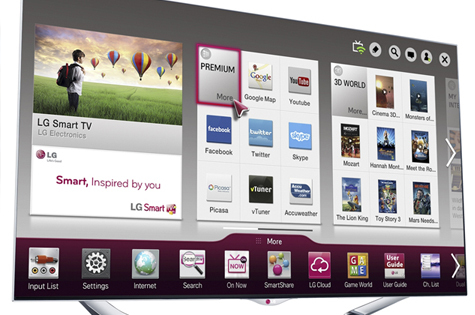 Smart TVs are setting the trend at this year’s Consumer Electronics Show (CES) in Las Vegas, NV. The Smart TV Alliance—a universal Smart TV platform consisting of manufacturers like LG, Panasonic, and Toshiba—unveiled a new set of applications aimed at unifying your television-viewing experience with the Internet. Over the next year, the Smart TV Alliance will be working towards creating a connected environment across all of its member television manufacturers. The end result will include thousands of applications from weather to news to games to social media—all from the comfort of your television’s remote control. The goal will see users able to load apps on one television, and when a second television is purchased down the road—even if it’s from a different manufacturer—they will be able to load the same apps and content from the Internet. Does a connected, Smart TV in the living room appeal to you? Sound off in the comments below. With moms constantly on the go and kids demanding more than ever online (be it at home or in the classroom), families are facing more of a challenge to stay caught up with living in a digital home. Apps, gadgets, and “smart” technology for the family are largely in focus at the Consumer Electronics Show (CES) in Las Vegas, NV, this year. Baby wireless monitoring is a technology being elaborated on this year for new moms, with gadgets like the Vtech Safe & Sound being unveiled. This state-of-the-art baby-monitoring device comes with a built in high-resolution digital camera, two-way intercom, and improved digital transmission so you get the clearest view and communication with your toddler. More affordable tablet computers will be on market this year. The VINCI is a tablet computer built just for children between the ages of one and nine. The VINCI Tab MV is designed for young children, allowing kids to communicate, stay entertained, and play games appropriate for their age group. The device runs on your home Wi-Fi network. When it comes to simplifying your everyday tasks around the home, “smart” appliances are set to go mainstream in 2013. Appliances on the market for around the house like your fridge, washer, and dryer will be connected to Wi-Fi. Consumers will be able to download an app on their smartphone, and notifications can be pushed to let you know when your laundry is done, or even when your child leaves the refrigerator door open. Robots are coming to a playroom near you. LEGO announced the Mindstorms EV3, to come out in the second-half of 2013, allowing your child to build the toy, integrate motors with built in IR sensors to allow them to move around, and connect them to an app on your smartphone—perfect for stimulating the minds of your tech savvy kids. What connected technology do you want to see in your home this year? Share them in the comments below.